People from Carmichael, Folsom and Roseville as well as Modesto are discovering the joy of contouring the neck and chin through liposuction. One such example is this beautiful women pictured here. She was bothered by the fullness under her chin. 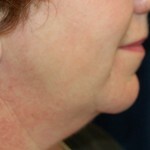 Despite losing weight and exercising to her fullest she found that this area just wouldn’t improve despite the effort. When she decided to proceed with body contouring we were all very excited for her. She underwent tumescent liposuction and laser liposuction using the Sciton Pro-lipo device. In under an hour 100 grams of fat was removed. She was awake for the procedure and worked the rest of the day. She was a bit swollen for a week but continued to work and did not require pain medication. Since that time she continues to receive compliments on her beauty and no one quite knows what it is she has done but they all love it. 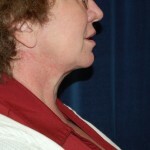 Liposuction contours the neck and makes the face more naturally thinner in appearance. At Chrysalis Cosmetics in Sacramento California liposuction and body contouring are procedures we specialize in and have many different options for you to choose from. We look forward to sharing in your joy of a new contour.